Shallow End of the Grebe Pool? Is it a coincidence that Peter Benchley spent the last years of his life on Boudinot Street, just a couple of miles away? I don’t think so. One hundred years ago today, A.D. Henderson of Belvedere, Alberta, canoed Silvermore Lake with a friend. While paddling around we noticed a [Red-necked] Grebe swimming along with a young one on her back…. On our approach the parent bird dived with the young one on her back and carried it several yards under water. The young bird came up first and seemed bewildered or lost. We paddled up to it and my friend answered its plaintive peeping, whereupon it swam up to the canoe and into his open hand. We admired the curiously colored little fellow a while and then turned him loose. No doubt to the relief of parent and young alike. 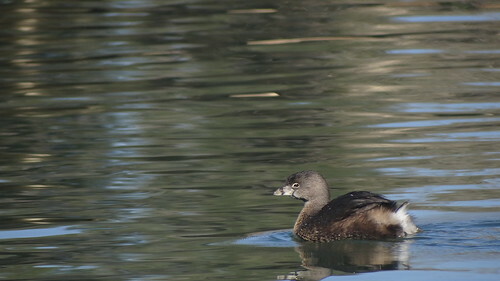 Though the species is well known to be migratory, individual Pied-billed Grebes strike me (misleadingly) as among the most sedentary of birds. I can count on one hand the number of times I’ve seen one in anything even approaching truly sustained flight, and sometimes I wonder whether they don’t use some sort of subterranean Northwest Passage to move through the continent’s aquifers with the seasons. I know you can fly too…. September has come … the evening is calms and beautiful; you spread out your wings, reach with some difficulty a proper height, and swift as meteors glide through the air, until, meeting with warmer waters, you alight on them. Poetic lie-cense, I guess we can call it. Charles Willson Peale was America’s first museum man, and his interests were as wide-ranging as the collections on exhibit in his Philadelphia museum. Birds, though, occupied the highest position among his interests and affections, and as a young man, he spent as much time as possible in woods and fields and marshes, a gun on his shoulder and hope in his heart. very first bird taken in this way, a grebe or ‘water witch’, was an experience never to be forgotten. Out on the water, the bird would dive at the flash of his gun, seeming to elude the shot. Peale outwitted it at last by running nearer to the shore each time it dived and standing still when it came up, thus getting within easy range and ‘pulling the Trigger before the water had run out of its Eyes’. The mounted bird is probably just out sight in the long cabinet revealed by Peale’s lifting the curtain. For all its technical clumsiness (the bird and the water do not exist in the same space at all), Catesby’s painting is a remarkable piece of ornithological illustration. The distinctive markings of bill, throat, face, and eye are accurate and precise, and the strange, hair-like, silky texture of the feathers is admirably well drawn. The challenge of showing the most characteristic feature of all grebes, the outsized, extravagantly lobed foot, is neatly met by depicting the bird mid-preen, the body slightly a-list. This bird weighs half a pound. The Eyes are large, encompassed with a white Circle: the Throat has a black spot; a black list crosses the middle of the Bill; the lower mandible, next to the Basis, has a black spot: the Head and Neck, brown, particularly the Crown of the Head and Back of the Neck is darkest: the Feathers of the Breast are light brown, mixt with green; the Belly dusky white; the Back and Wings are brown. These Birds frequent fresh water-Ponds in many of the inhabited parts of Carolina. This was a Male. That’s it: no mention of the bird’s habits, its voice, or the structural peculiarities so carefully depicted in the plate. The terseness and partially garbled syntax of the description and the unusually conspicuous typographical lapse in its title (P[R]ODICIPES) make me wonder whether something didn’t go wrong at this stage in the production of the book; had the printer perhaps spoiled or lost Catesby’s manuscript text, which was then hastily and carelessly replaced? The first in a monthly series about the world’s grebes.